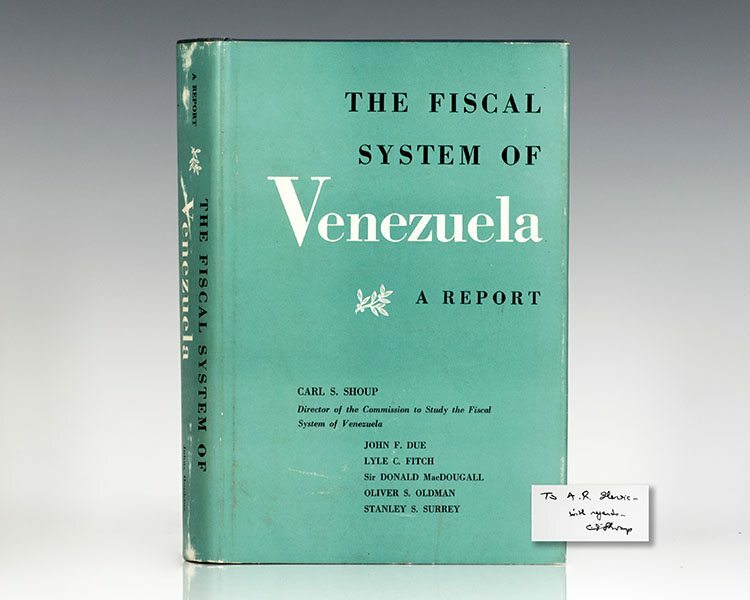 The Fiscal System of Venezuela: A Report. Baltimore: The Johns Hopkins Press, 1959. First edition. Octavo, original cloth. Inscribed by Carl Shoup on the front free endpaper, “To A.R. Ilersic with regards- C.S. Shoup.” Also laid in a signed letter from Shoup to the same recipient. Fine in a near fine price-clipped dust jacket. Edited by Carl S. Shoup. Contributors include John F. Due, Lyle C. Fitch, Sir Donald McDougall, Oliver S. Oldman and Stanley S. Surrey.